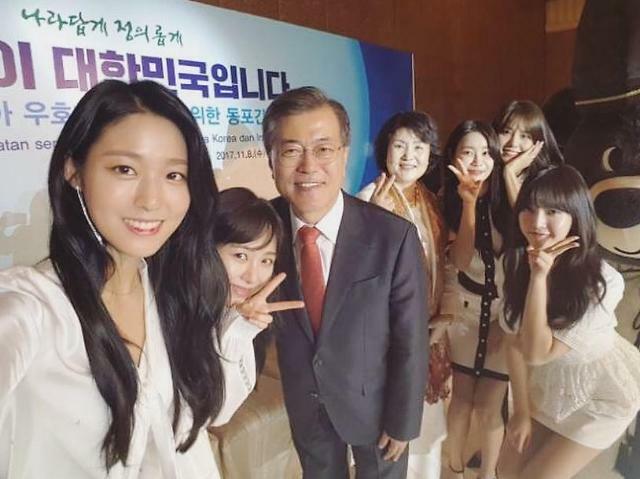 Seolhyun, a member of South Korea's popular girl band AOA, uploaded a selfie she and other members took with President Moon Jae-in during his meeting with Korean residents in Indonesia. "Thank you for your kind manners with a warm smile," the 22-year-old said in her Instagram post. AOA is in Indonesia to promote next year's Winter Olympics in the eastern ski resort of Pyeongchang. Moon visited the country for a summit with his Indonesian counterpart Joko Widodo. The Instagram post garnered over 100,000 likes and thousands of fans left comments congratulating the girl group for taking such an honorable selfie shot.